My wife and I had originally been referred to a local company but they weren’t much help and unresponsive. We then set out to find a recommended company on Homestars and found Andrew. I thought that we couldn’t go wrong with a company that had this high of rating and this many great reviews and they weren’t wrong! From our first meeting, to the follow-up, to the installation, Andrew was nothing short of professional. He’s extremely knowledgeable passionate about his craft and it shows in his work. Our new front door is everything we always wanted and Andrew helped make it happen. I wouldn’t hesitate to recommend anyone that’s interested in exploring the idea of a new door to Andrew. We’ve already received a ton of compliments from the neighbours! We've been looking for a metal and glass door insert for quite some time before discovering Lusso Designs. We wanted something contemporary and unique but saw the same generic designs from various retailers in the GTA. Andrew was the only retailer that offered unique, locally manufactured custom designs at a fair cost. 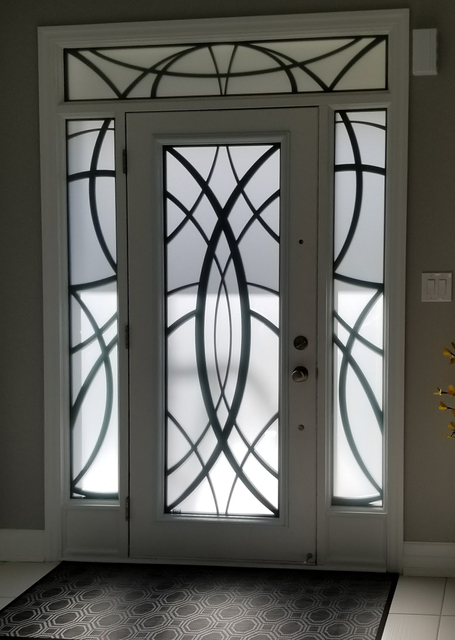 Our package included laser cut metal inserts sandwiched between two panes of privacy glass (you can select the level of transparency; we opted for acid etched), mouldings, upgraded hinges and a peephole. We're extremely happy with our new door and have received a barrage of compliments from our friends, family and neighbours in the first week. I would not hesitate to choose Lusso Designs again if provided with the opportunity. Thank you, Andrew, for a beautiful front door. Andrew from Lusso design cake up to our home in Georgina and sat with me for over an hour explaining the details of getting a new door, what a new door system is comprised of, what our choices were including the pros for each option and of course the cost. I felt so prepared and well educated in the decision we made and I appreciated his careful attention to our interest. We decided on a wrought iron design and then changed our minds and went with a custom look. We are so incredibly happy with our choice. The installation was so carefully carried out, they made sure it was perfect. We are so happy with our new door and couldn't speak more highly of andrew. His personality and friendly disposition was also welcomed. I would recommend his work to anyone. 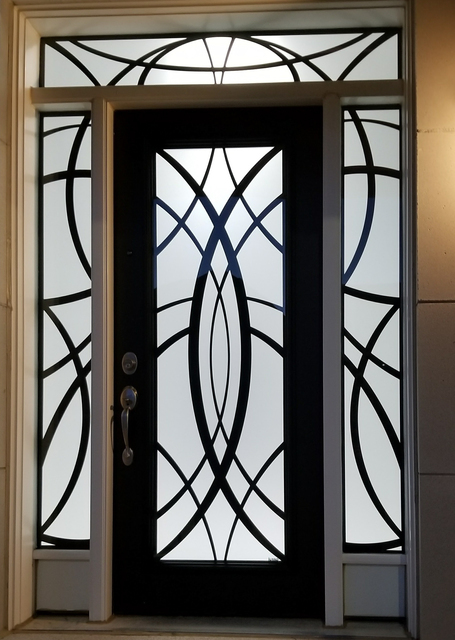 After searching on Homestars for an installer of wrought-iron inserts, I came upon Lusso Design. Upon reading the multitude of positive reviews, I felt I needed to contact them for an estimate. After meeting Andrew and discussing my needs, I knew that he would be a great choice....and it turned out that he was. Andrew was pleasant and professional to deal with; his estimate was very reasonable; and his work and attitude were outstanding. He was very helpful in assisting in the custom-design of the inserts, and the small touches he provided (eg. upgraded hinges; black trim; etc) were a bonus. We are very pleased with the work that Andrew provided, and would easily recommend him to others. We are absolutely happy with our new front door, it looks very good and we constantly have comments on it. Andrew is truly passionate by his work and is very knowledgeable. He made for us a very nice design based on inspiration pictures I sent him. It came out exactly how I wanted it. I highly recommend Andrew for this work. His prices are also very fair. I was looking to replace my front door and came to HomeStars for a recommendation. From my initial conversation to completion, I was very impressed with Andrew's professionalism and commitment to his job. It is very evident that Andrew takes pride in his work. He works meticulously and patiently. He explains everything so you aware of what you are purchasing; his products are high quality. He is easy to deal with and trustworthy. I am extremely happy with my door and the service provided by Andrew; I would wholeheartedly recommend him. Detailed reviews mean more; this is detailed, and Lusso Designs deserves the effort to write it. BOTTOM-LINE: Don’t look anywhere else; Andrew is the man. ESTIMATE PREPARATION: Spent over two hours on-site with us discussing the options. Prepared the estimate on-site and shook hands. GLASS INSERT DESIGN AND MANUFACTURE: We chose an older art nouveau look. A modified custom design for the doors and full custom design for the sidelights. Andrew went the extra mile to have the in-glass iron-work painted to our particular colour to match house stair railings. Looks beautiful! Glass inserts manufactured in North York to Lusso blueprints. PRICE: Within a few dollars of the LOWEST of several estimates and much lower than a few. Read this in the context of a custom design, as described above. Others were off-the shelf only. DEPOSIT: Very reasonable at only 10%. Would not begin to cover his material cost commitment for the job. SCHEDULING: Gave us a date range and then called two weeks before to confirm the date; a Sunday. They are busy and deservedly so. CONSIDERATION: Called 90 minutes ahead of schedule to ask if they could be an hour early. MORE CONSIDERATION: Had a radio at low volume; asked if it bothered us, which it did not. TIMELINESS OF COMPLETION: Estimated at five hours; were complete in well under four hours. WORK ETHIC AND ENERGY: Very high for both Andrew and assistant. Did not stop; drank the coffee we offered on-the-fly. They brought their own lunch and ate it in 15 minutes. ATTITUDE: Very polite and easy to get along with. EVEN MORE CONSIDERATION: Very careful with floors, mess and everything else. Swept and vacuumed afterwards. WORKMANSHIP: Meticulous. My office is next to the front door so I had a perfect view. The quality of the end result is perfect. New, heavy duty security hinges, new weather stripping and new floor sweeps at the bottom. Doors open easily despite the weight of the glass. TRUST: Accepted a personal cheque, which is trust. "He who trusts may in turn be trusted". And he can be trusted. OVERALL LOOK: The design of the glass, iron-work and surrounds look wonderful. At once elegant and subtle, yet an immediate eye-catcher and focus of attention. IN SUMMARY: If we did this again at a different house, we would not look around; Andrew at Lusso Designs is our choice.